Organizing can be fun! 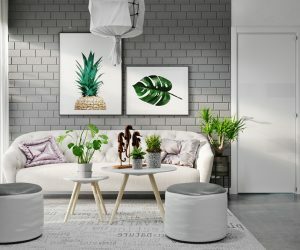 Whether you're searching for creative storage solutions out of necessity or decorative desire, this post can help you find unique pieces that you probably won't find at your local furniture store. 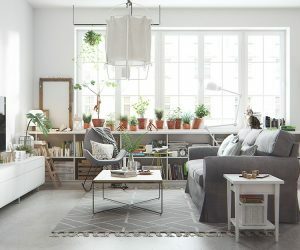 We've compiled a list of wonderfully distinctive shelves ranging from super-modern choices for minimalist or industrial interiors to charming rustic options for cottage styles and Scandinavian-inspired homes. 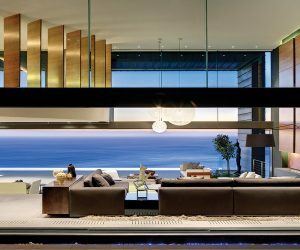 You'll find neat selections for every room in the house – kitchen, living room, office, and there are even a few geeky and novelty shelves for the game room or home theater. 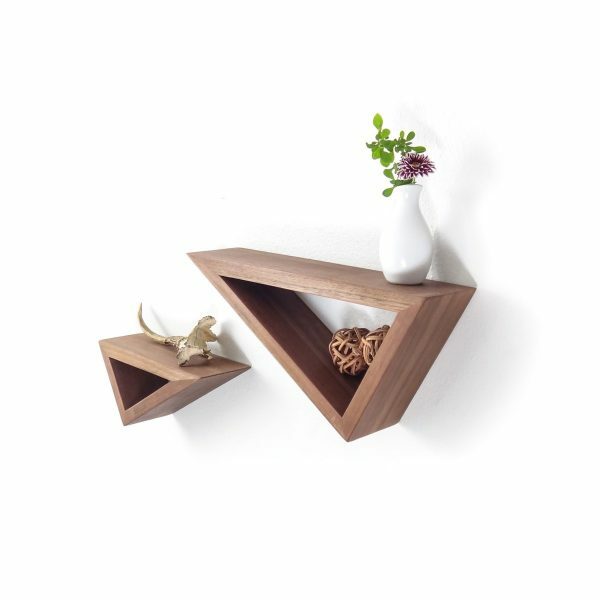 Fishbone Shelf: This collection is artistic, modular, and flexible. 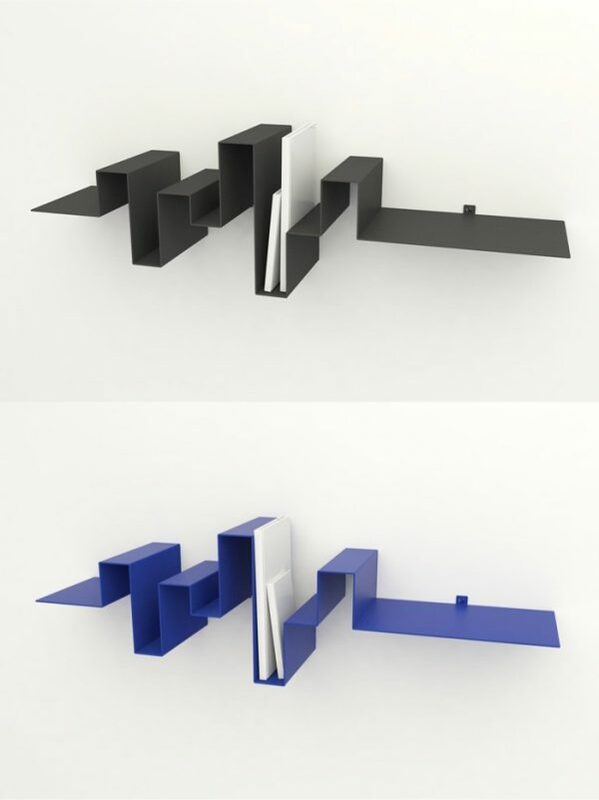 Rotate the shelves whichever way you’d like – the unique shape embraces books from any angle. These would look wonderful within a modern Scandinavian style interior. 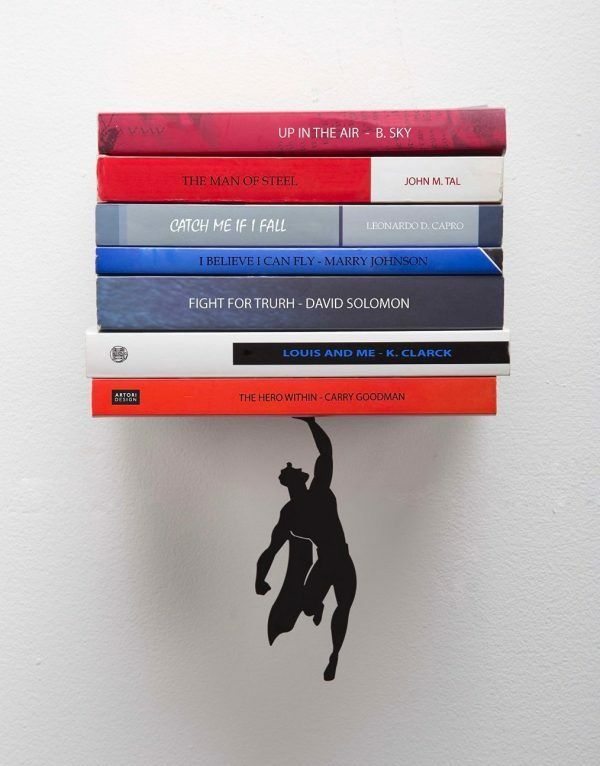 Supershelf – Superman Metal Floating Shelf: Do you need an extra shelf for your comic room? Books hide the shelf unit and the superman cutout attaches magnetically. 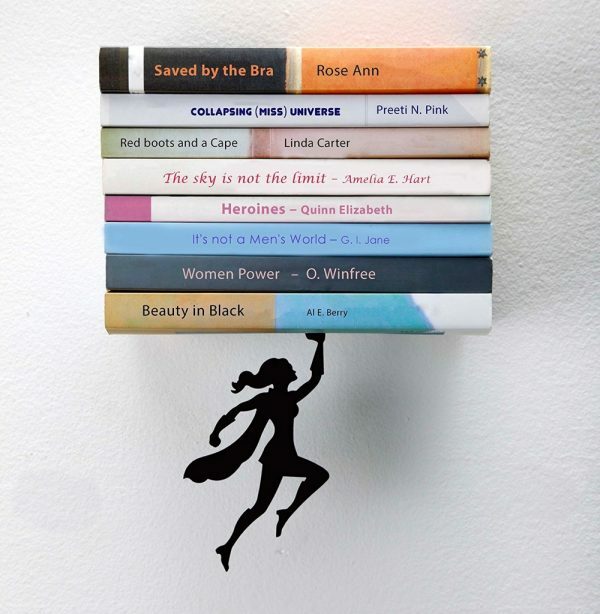 Supershelf – Superwoman Metal Floating Shelf: Here’s a shelf in the same style, this time featuring a super tough super woman. Pair with your other comic book decor or give as a gift to show appreciation for the woman in your life who manages to do it all. 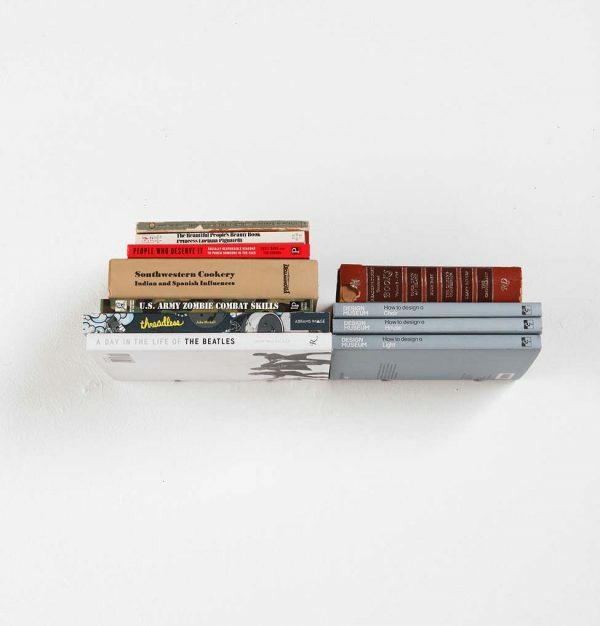 Invisible Book Shelf: Have you ever wondered how these “floating” bookshelves work? 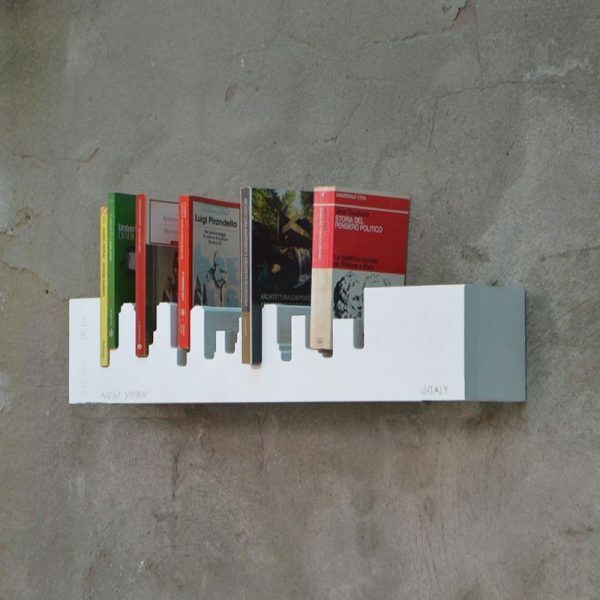 Simply slide the shelf inside of a large and sturdy book, and slip the bottom cover into the tiny hooks that sit flush against the wall to prevent the cover from hanging. 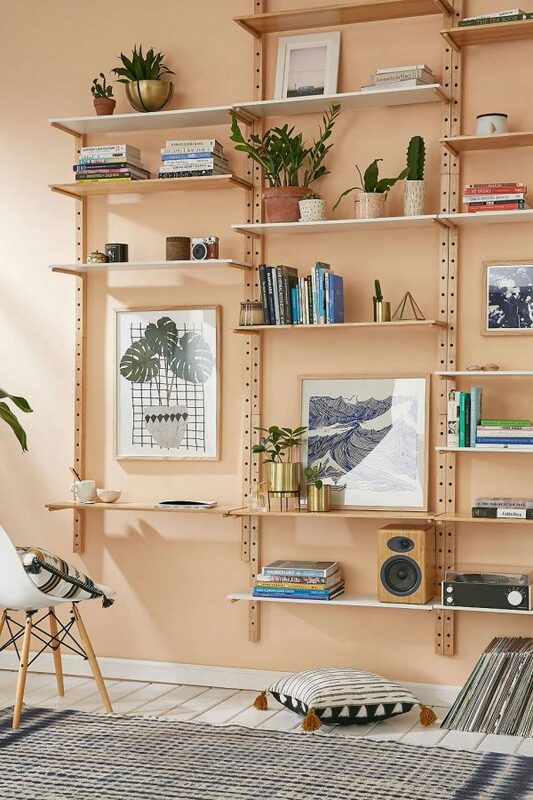 Adjustable Perforated Shelf: Combining chic Nordic influence with a slight industrial edge, this modular shelving system is an easy way to add color and expand storage at the same time. Each set includes two shelves but adding more is easy with the unique connection system. 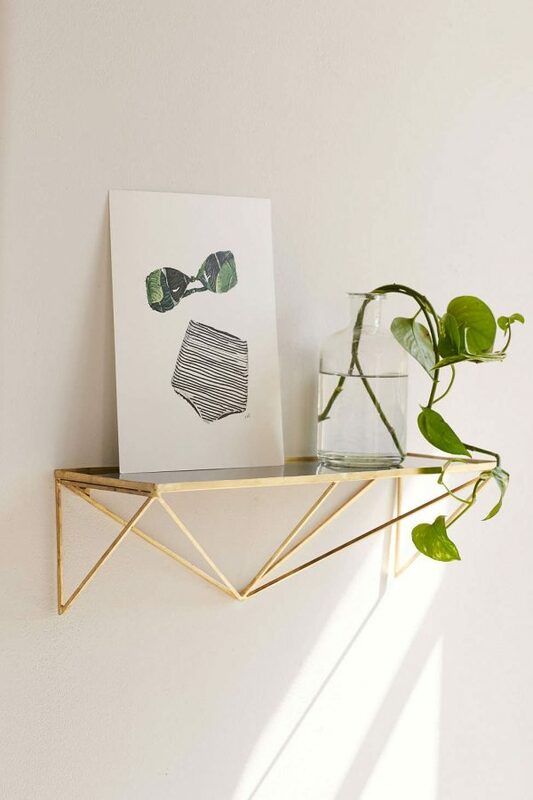 Diamond Cross Planes Shelf: Interiors designed around geometric patterns could totally make great use of this shelf! Three tiers offer plenty of room for small potted plants and books. 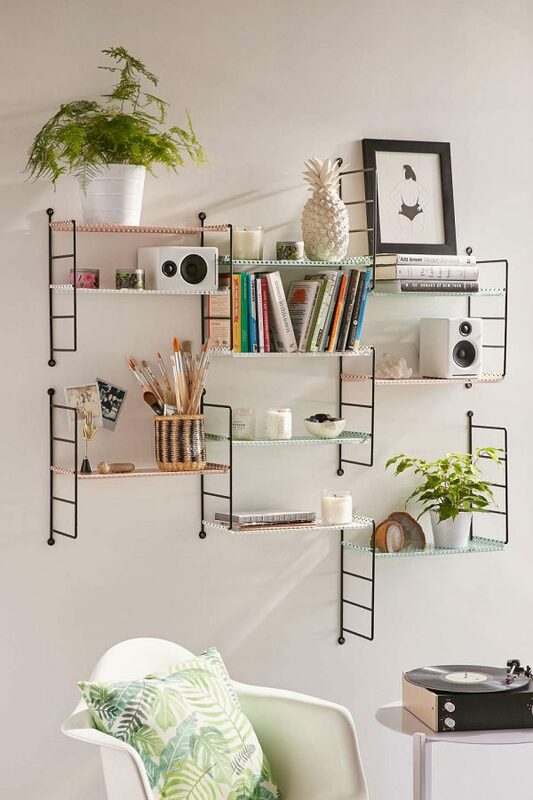 Metal Shelf With Wood Planter: Planters and shelves always make a great combination! 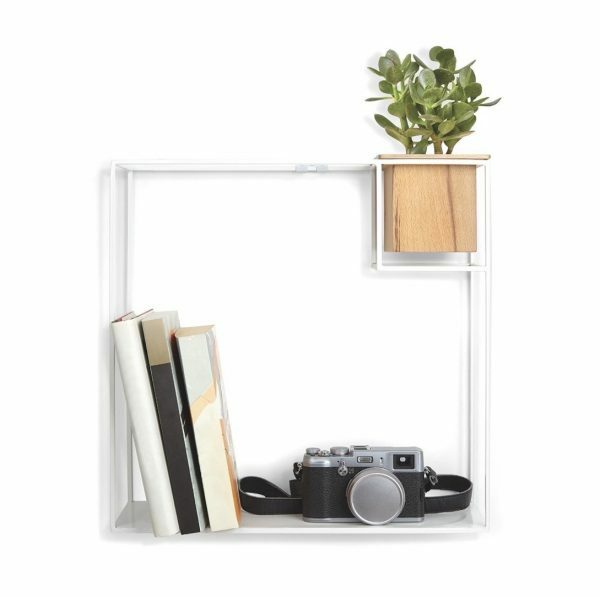 This simple framed-in shelf would add a nice decorative touch for a minimalist interior. 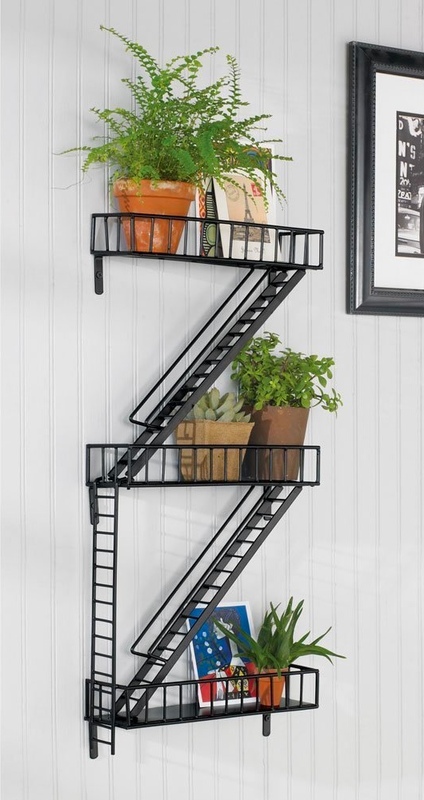 Fire Escape Shelf: Are you looking for a touch of the city in your suburban home, or maybe want to embrace your industrial side? This fire escape shelf is a great place to start. Stack multiple shelves to create skyscrapers right in your own home. Peak Shelf: Gold accents add instant elegance to any room. 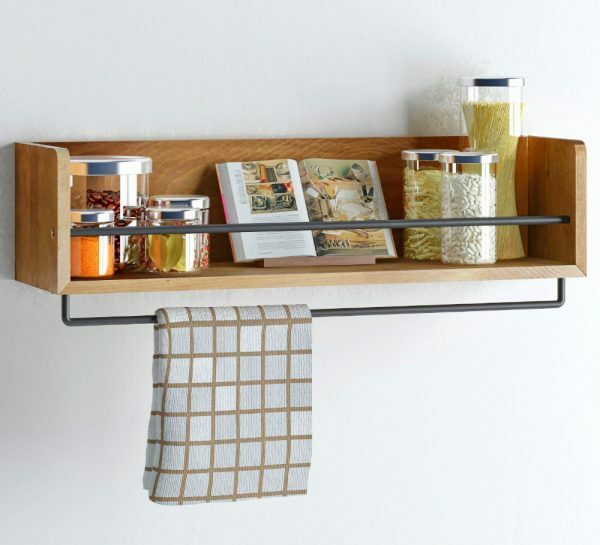 This streamlined shelf catches attention from miles away while maintaining a low-profile form appropriate for smaller spaces. Brisbane Wood Storage System: Super-adjustable pegboard shelves accommodate accessories and electronics of any size. Unlike other modular wall systems, you could reconfigure this one on the fly. 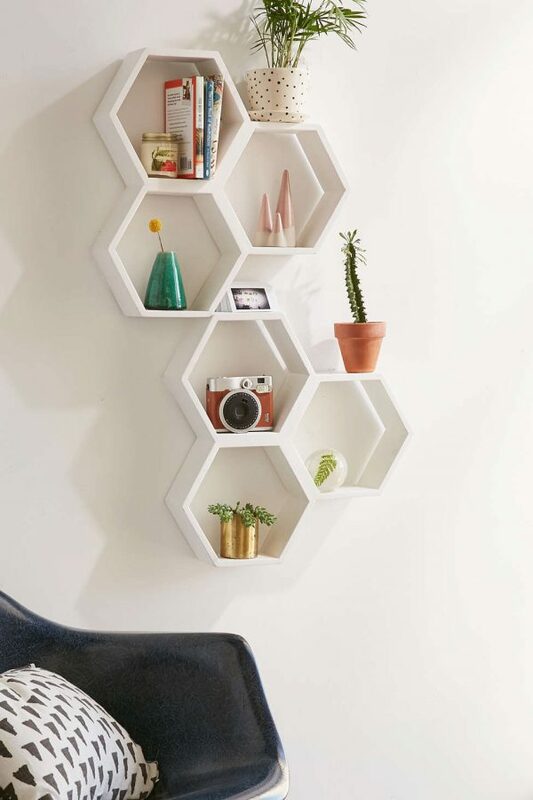 Hexagonal Wooden Shelves: This fresh honeycomb would look equally at home in a minimalist, geometry-themed, or Scandinavian modern interior. 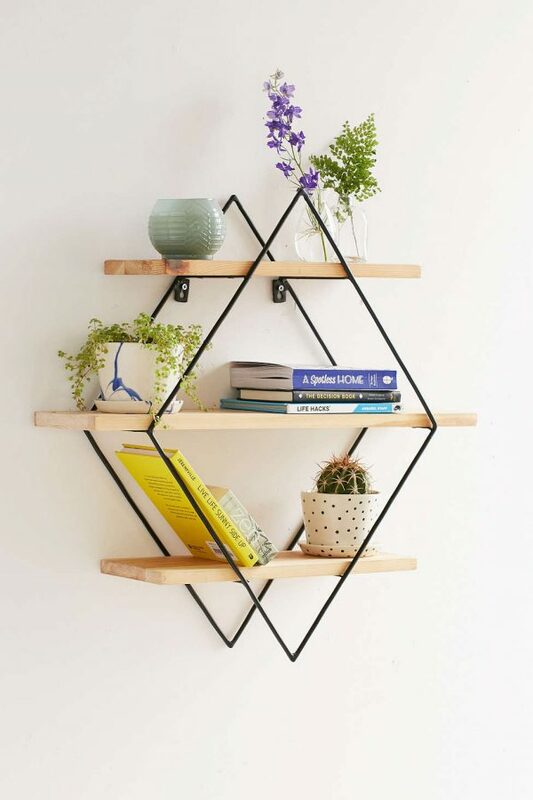 Triangular Floating Shelves: Asymmetrical decor is a great way to break up the rigidity of a geometric decor theme. As this image illustrates, it’s easy to further accent the shelf by tucking baubles or ornaments inside the triangle. 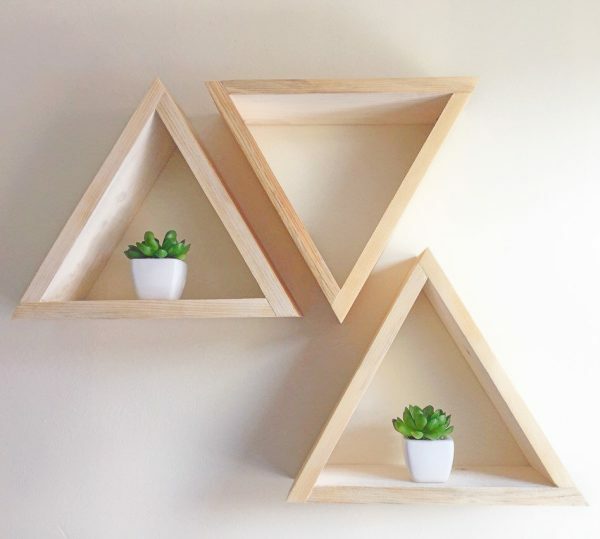 3 Triangular Shelves: Clear oil finish brings out the grain on the outer edges of these adorable triangular shelves. The insides remain unfinished just in case you feel like adding a splash of color to your interior with a little DIY customization. 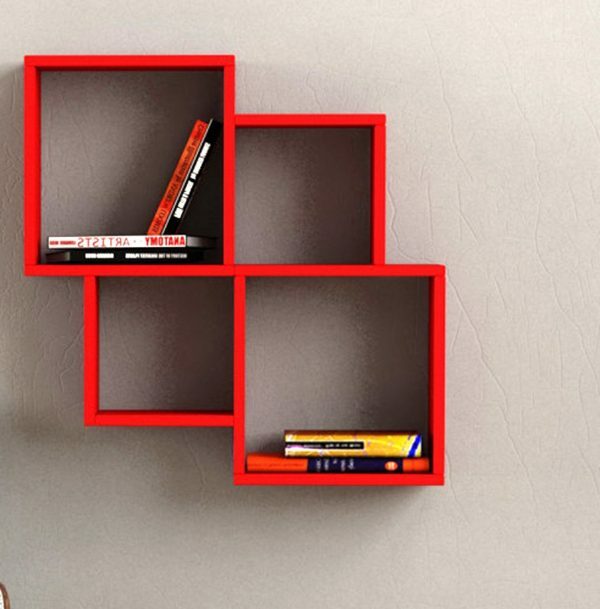 Minimalist Square Shelves: It doesn’t get much simpler than this. These square shelves capture attention with their thick and attractive frames, with plenty of room to store items on top and inside. Each set includes all three sizes and they’re available in black too. Modern Intersecting Shelves: Do you love the bold framing of the previous shelves but want something a little more decorative? These intersecting squares offer just a little more visual interest. The smaller niches would be perfect for tiny air plants. 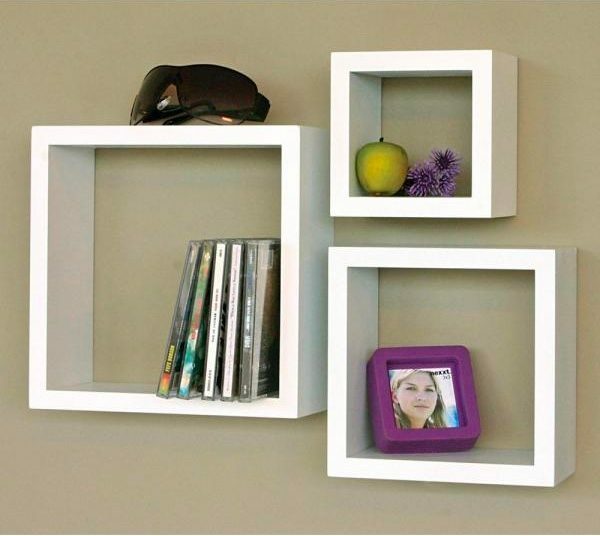 Simple Modern Wall Shelf: Available in every color of the rainbow, these shelves are just what you need to bring your favorite color theme to the walls. Nexera Next Wall Shelf: Enjoy the look of open and closed shelving with a single piece thanks to this unique sliding door. 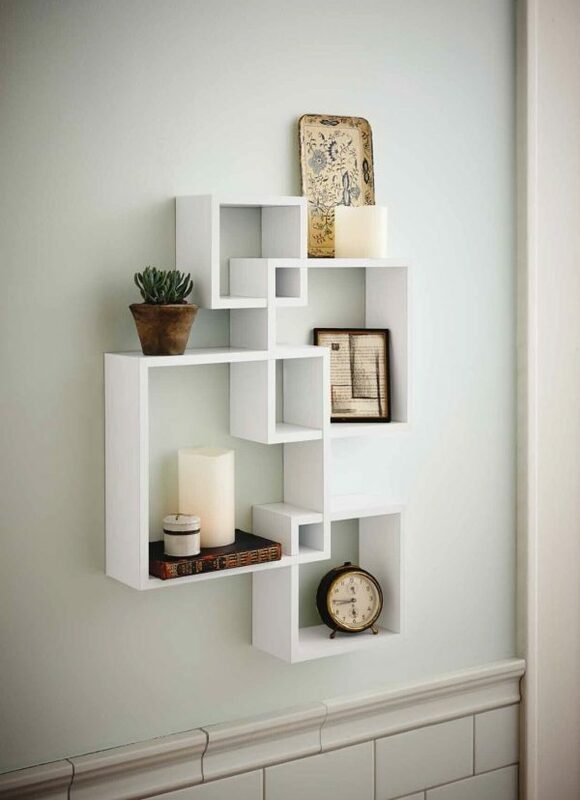 This shelf is ideal for a messy entertainment area or home office. 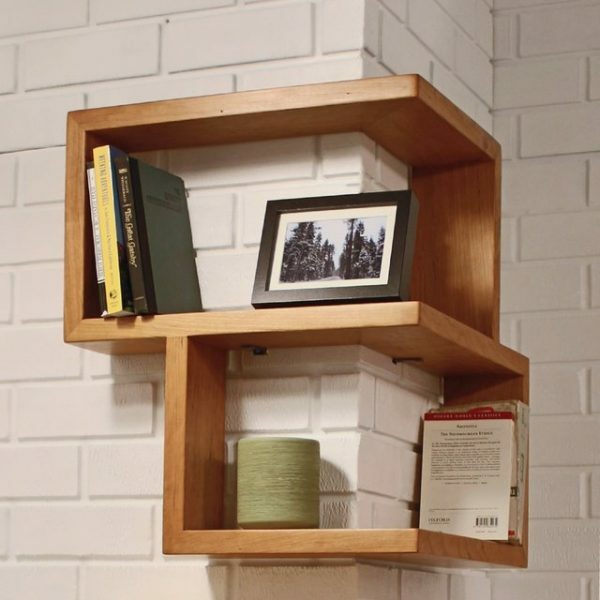 Floating Corner Shelf: There are two ways to hang this versatile shelf! 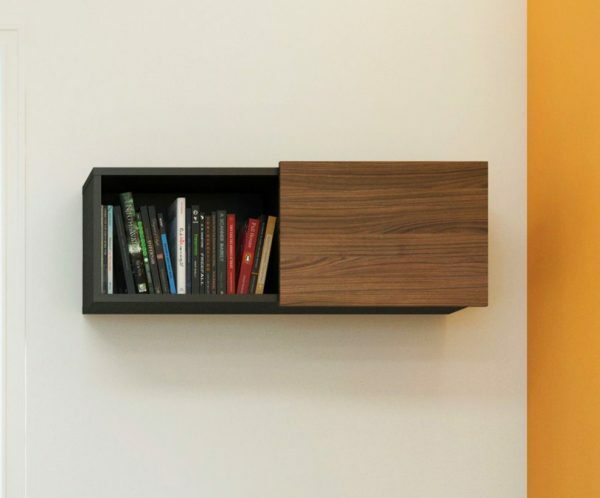 Unlike other corner shelves, this one can also wrap around the corner itself – a great solution for complicated spaces. 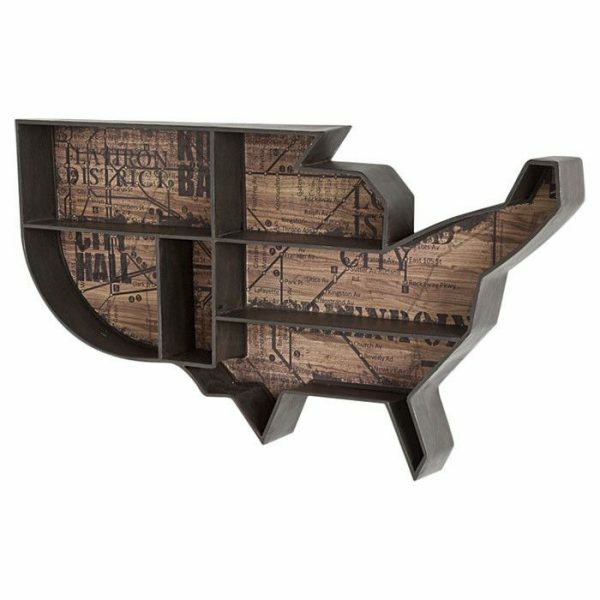 USA Bookshelf: Travelers can use this USA-shaped shelf to display keepsakes from every region they’ve visited. This piece would look right at home in a vintage or rustic style interior. 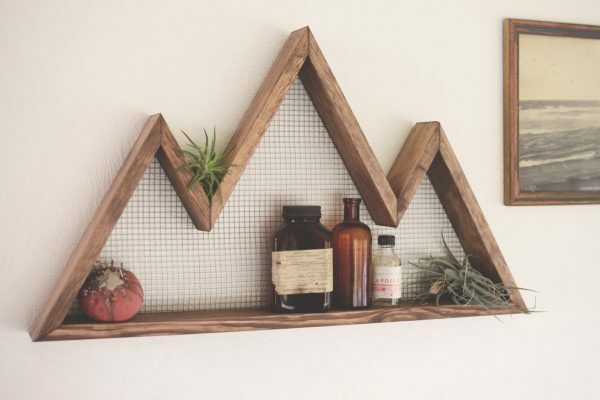 Mountain Wall Shelf: This is definitely a great choice for a rustic or cottage interior style – of course, the wire backing could enhance an industrial interior as well. 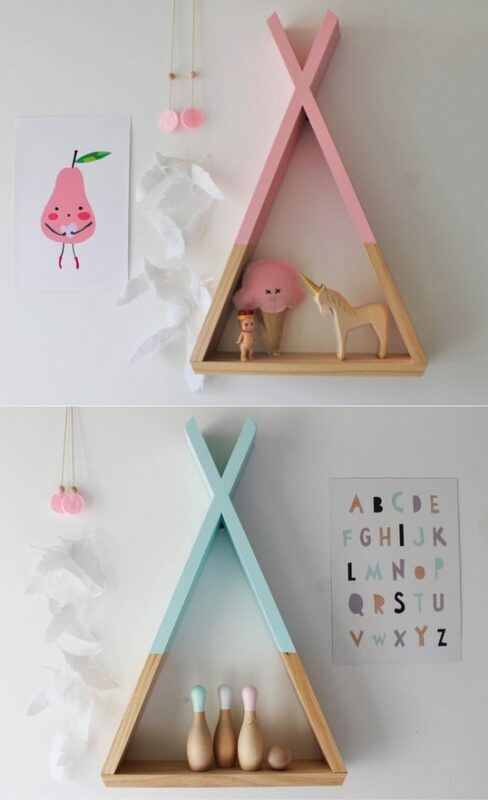 Kids’ Wall Shelves: Check out these adorable dip-painted teepee shelves! Available in a variety of pastel hues, these are sure to fit within any whimsical children’s room. 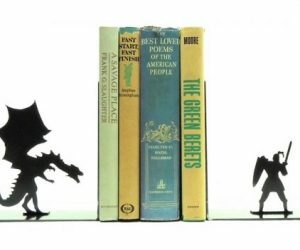 But even adults might find these too sweet to pass up for a themed room. 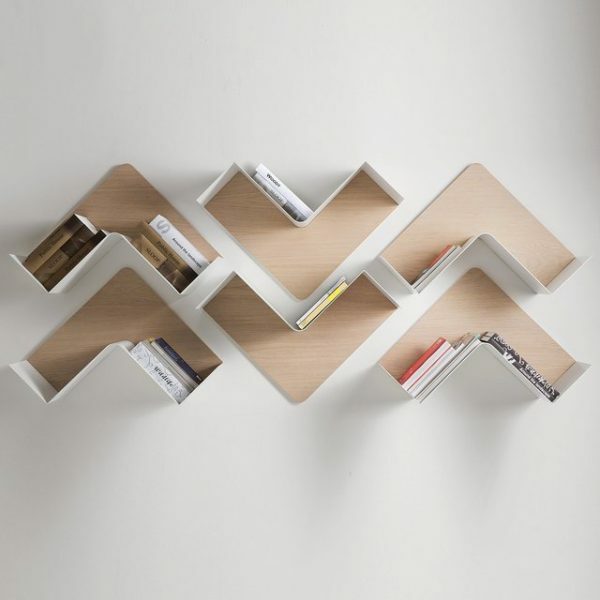 Storyline Bookshelf: Shaped like a skyline, this shelf would definitely add a touch of abstract interest to a minimalistic or futurist style home. Plus, perfectionists with a little extra time can make sure all their differently sized books form a straight line. New York Skyline Shelf: Here’s another skyline themed bookshelf for the New Yorker in all of us. This is definitely a statement piece. Each one is carved from solid wood and manufactured in Italy. 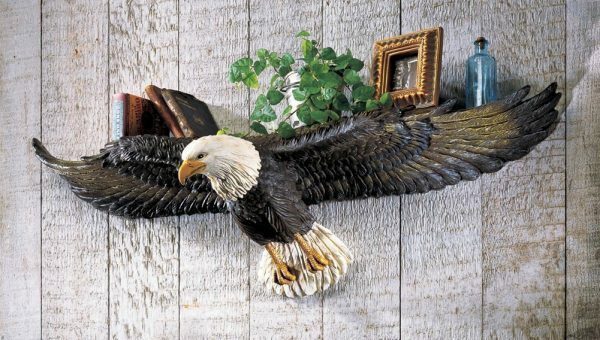 3D Eagle Sculpted Wall Shelf: Incredibly detailed, this bald eagle wall shelf would make a lovely gift for a birder, conservationist, or an especially patriotic American. This might look neat in a rustic styled home or even a motorcycle shop. Whale Shelf: Cute! 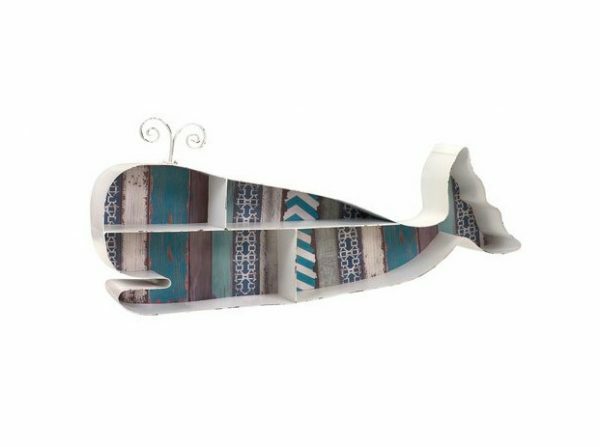 This artsy whale is made from metal and distressed wood with colorful patterns, awesome for a craft room or a cottage-style household. 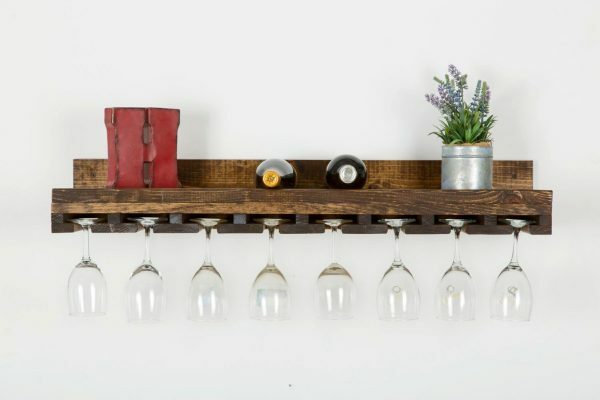 Rustic Floating Shelf: Complete with a wine glass rack, this shelf is just begging to complement your rustic kitchen or formal dining room. Grow small potted herbs or store your spices on the shelf above. Shabby Chic Shelf: Here’s another neat wooden shelf for the kitchen, this time with a distressed look. Hooks make it easy to display your favorite mugs proudly. 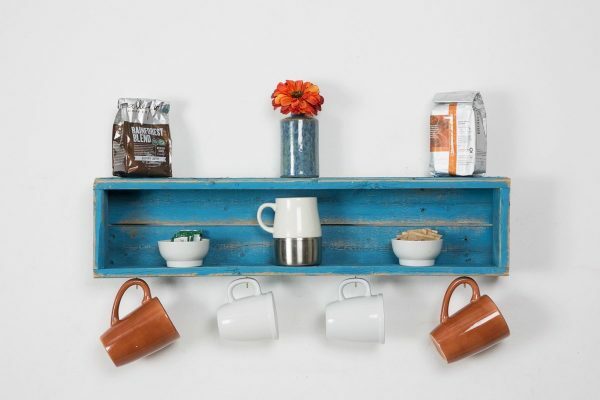 Rustic Kitchen Wall Shelf: Another great multipurpose pick! This one includes a towel holder, but you could easily add hooks for mugs or utensils or other hanging items. 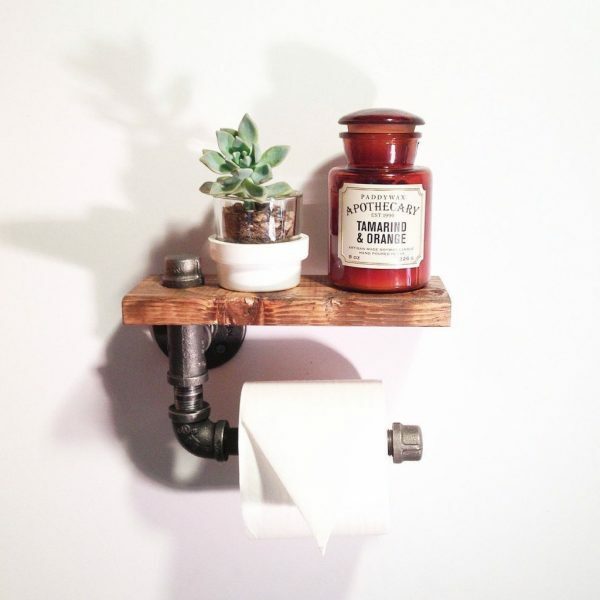 Small Steampunk Shelf: Even the bathroom can benefit from creative shelves! This neat steampunk construction easily holds a roll of tissue, but the upper portion would be a nice home for spare rolls or a nice scented candle. Stylish Floating Shelf With Edison Lamp: Can you imagine a more perfect shelf for a small entryway or bedroom? 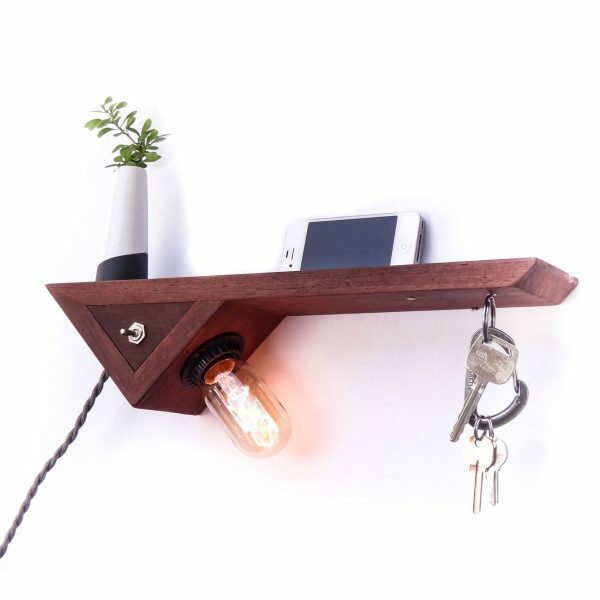 Magnets serve as a low-profile key catch, the warm Edison bulb casts soft illumination, and the shelf features a convenient groove to hold your phone in place.